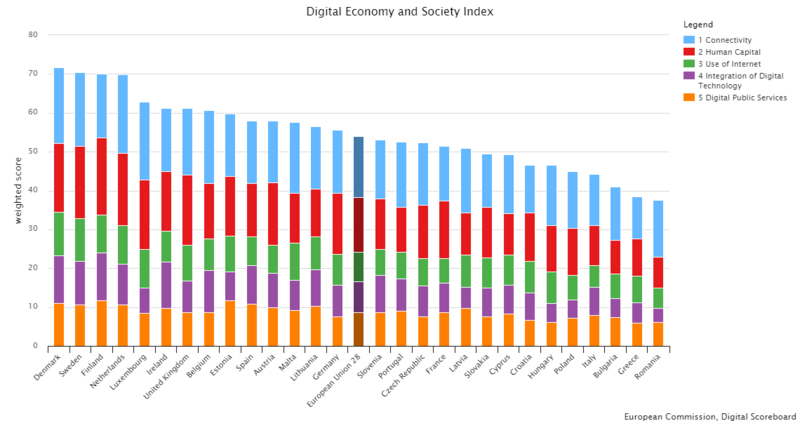 The Digital Economy and Society Index (DESI) is a composite index that summarises some 30 relevant indicators on Europe’s digital performance and tracks the evolution of EU Member States, across five main dimensions: Connectivity, Human Capital, Use of Internet, Integration of Digital Technology, Digital Public Services. Read reports and methodological notes. In 2017, all Member States improved in the DESI. Ireland and Spain progressed the most (close to 5 points as opposed to an EU average of 3.2). On the other hand, there was low increase in Denmark and Portugal (below 2 points). The Netherlands gets the highest scores for Connectivity (2016 data), Finland for Human Capital (2017 data), Denmark for Use of Internet (2017 data) and Integration of Digital Technology (2016 data) and Estonia for Digital Public Services (2017 data). The Czech Republic ranks 18th in DESI 2017. Compared to last year the country progressed in Digital Public Services and remained stable in Human Capital, but worsened its ranking in other dimensions. The country performs best in Integration of Digital Technologies by Businesses, mostly because many SMEs embraced eCommerce. The country’s greatest challenge in digital is to improve the use of internet services, in particular for eGovernment and for entertainment and social purposes. 1) Connectivity: The 4G coverage of the Czech Republic is well developed and stimulates mobile broadband take-up. However, there is no progress in fixed broadband take-up and affordability has worsened. 2) Human Capital: The Czech Republic is slightly below EU average. More people are online, but only 54% of the population have at least basic digital skills. 3) Use of Internet: Czech internet users perform banking transactions and increasingly shop online; they use internet for content (music and video) and communication (social networks) less than the average European. 4) Integration of Digital Technology: SMEs largely use internet as sales channel; a quarter of them sell online, half cross border, and they are 2nd in the EU in terms of eCommerce turnover. However, the use of other digital technologies is more limited. 5) Digital Public Services: The country has progressed in both demand and supply of eGovernment services over the past year, although performance remains below EU average. A summary in Czech is attached below.